Very fun and our host was engaging and funny. Very fun and our host was engaging and funny. Nice trip on the water. You get to see a lot of highlight of the city but it could also get quite cold especially when the duck is in the ocean. Duck Tour was fun and gave you an interesting tour of the city and port area. Duck Tour was fun and gave you an interesting tour of the city and port area. Kaitlyn was a great guide and Bruce was a fun captain. We felt safe and explored the town both on land and sea. Great way to see the town in 2 hours or less. Loved the tour with Captain Peggy and Jacob! Loved the tour with Captain Peggy and Jacob! Both were funny and knowledgeable. Great sight seeing! Ketchikan is a very nice place with an interesting story. Ketchikan is a very nice place with an interesting story. The guides on the Duck Tour did a great job at explaining the city and pointing out wildlife. The tour guides were entertaining but it was very scripted. The tour guides were entertaining but it was very scripted. They gave some interesting info about the town and it&apos;s history. We even saw a sea lion in the harbour. Overall, a good time! We went aboard the Duck Boat and toured the city first. Boring. 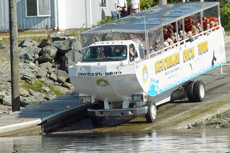 Tour Guides really tried their best, but the slow rumble of the home made amphibious vehicle made everyone fall asleep. They kept pushing the $3 duck whistle souvenir throughout the tour. Sort of fun but driver and guide would not shut up entire ride to much info. Lee was an excellent tour guide. Lee was an excellent tour guide. We learned a great deal about Ketchikan and had a great time. Shop at the Tongass Trading Company - great items and reasonable prices. Not what we were expecting -- on other city Duck Tours, there is a lot of fun and joking, etc. Not what we were expecting -- on other city Duck Tours, there is a lot of fun and joking, etc. This was sedate. Hated it! Do not spend your money! Brought you through town, which was nothing, then brought you in bay to see absolutely nothing. Keep your money! Duck tour was fun - they take you all through town and then into the water. Duck tour was fun - they take you all through town and then into the water. It was about an hour and a half total. The guides were entertaining and knowledgeable, and you get to see the city from land and water. My husband and I booked this because we thought our 6 and 7 year old sons would enjoy it. Was ok but Seattle&apos;s was much more entertaining. A great tour of Ketchikan! A great tour of Ketchikan! Really fun thing to do with the kids. Rode the Ducks and had a very knowledgable driver and separate tour guide. Rode the Ducks and had a very knowledgable driver and separate tour guide. Didn&apos;t wander too far from the Ship as it was raining as usual in Ketchican. The duck tour was fun and included going on the roads to see some of the town and in the water. This was a blast for our six year old son! This was a blast for our six year old son! I would recommend staying in town to shop local art, eat King crab and check out all the amazing Totems. We were so disappointed with this!